Please meet Laura Gardash, who is a Canadian yoga teacher and momma. 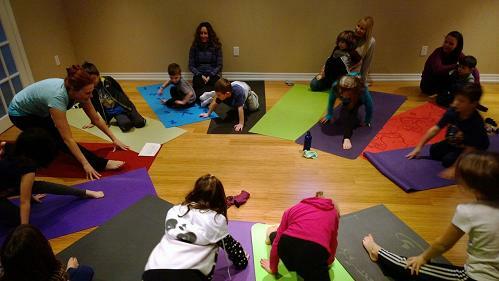 Enjoy this article as she describes how she planned a kids yoga holiday party with her eight-year-old daughter. Don’t miss their free downloadable yoga story, The Butterfly in the Jungle. Hopefully, her story will inspire you to host your own kids yoga party, to bring movement and fun to your child’s special celebrations. They came, they acted like animals, they ate candy… Yup! 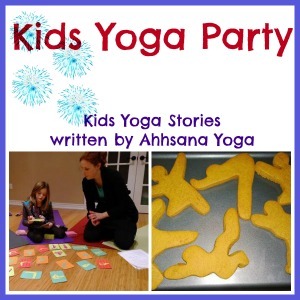 It was a kids’ yoga party! Baby steps, Hannah…let’s start with a yoga party! And so, Hannah and I drafted and sent invitations to our first ever Kids’ Yoga Holiday Party, and then we drafted our yoga story. Thirteen kids participated, some more than others. Some took the idea of a pose and followed their hearts, like my nephew Hayden, who thought he’d rather jump whenever we said the word “frog”. Made sense. The one thing I’ve already learned about teaching yoga to kids is there’s nothing quite like it to teach a teacher how to let go. After our story, we turned the tables, or should I say “mats,” on the kids, letting them be yoga teachers too. I figured if Hannah was keen, wouldn’t every kid be? Of course, I had pre-selected cards from The Kids’ Yoga Deck to ensure that the poses were geared to our age group (3-8). 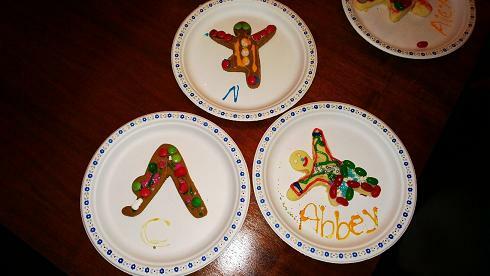 While no party, no kids’ party at least, is complete without cookie decorating, no kids yoga party is complete without gingerbread yogi cookie decorating! We had to replenish the calories we had just burned, after all. 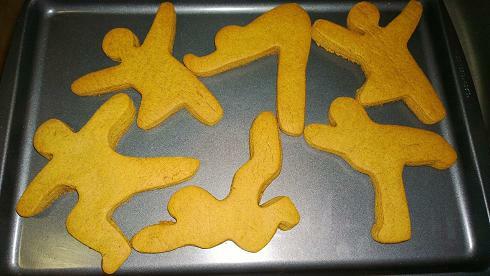 I found these Yummi Yogi cookie cutters at YogaRVing at the very last minute. YogaRVing’s MaryAnne and Sally got them to us just in time! I received excellent feedback from the kids and their parents, making it highly likely that we’ll do a holiday kids’ yoga party annually! You should try it too! Laura Gardash who has been teaching classical Hatha yoga since 2008, mostly to adults at IBM where she also works as a technical editor. During the fall of 2013, Laura started her own yoga studio, Ahhsana Yoga, from her home. She’s new to teaching kids but loving every minute of it because it teaches her to face her biggest self-inflicted obstacle: overcoming her challenges with letting go. Laura lives in Maple, Ontario (Canada) with her husband Mike, daughter Hannah, son Nathan, and two black cats Peek and Boo. 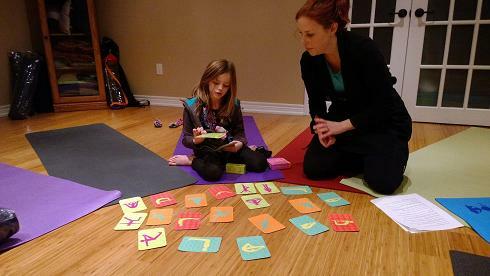 Do you have a story to tell about teaching yoga to children? We would love to hear from you! Please email giselle at kidsyogastories dot com. Oh wow! How much fun!!!! Thanks for sharing, and for the great party idea! Thank for sharing such a great idea!